December 6, 2005. Proposal for a Decision on an Amendment to the TRIPS Agreement. Implementation of Paragraph 11 of the General Council Decision of 30 August 2003 on the Implementatino of Paragraph 6 of the Doha Declaration on the TRIPS Agreement and Public Health. Note: A lot of the content on this page is older material from the export debate between the signing of the Doha Declaration and the August 30th Agreement. To jump to this part of the page, click here. Also included on this page are Examples of Legislation to Allow for Paragraph Six Exports. December 10, 2005. James Love. European Commission spin on "delicate issue of compulsory licensing." December 9, 2005. Mike Palmedo. Press coverage of WTO Rules on the Export of Generic Medicines Produced Under Compulsory License. December 6, 2005. Statement of CPTech on TRIPS Amendment. December 6, 2005. James Love in the Huffington Post. Bush and Mandelson to Us: Drop Dead. December 6, 2005. Thiru Balasubramaniam. WTO TRIPS Council meeting-Bad deal expected. November 7, 2005. Manon Ress and James Love. Memo to Christine Lagarde, Ministre déléguée au Commerce extérieur, France. EU "opt-out" of WTO provision to import generic medicines. November 2, 2005. Statement to the of the Subcommittee on Labor, Health and Human Services, Education and Related Agencies of the Senate Committee on Appropriations. Possible Avian Bird Flu Pandemic Highlights Flaws In U.S. Trade Policy. October 28, 2005. Thiru Balasubramaniam. Deadlock on TRIPS and Public Health deliberations on a "Permanent Solution." October 25, 2005. Statement to the WTO TRIPS Council by CPTech on behalf of Consumers International. Avian flu and the August 30, 2003 decision. October 19, 2005. Letter to EC Director General of Trade Peter Mandelson. October 19, 2005. Letter to EC Director General of Health and Consumer Protection Markos Kyprianou. October 19, 2005. James Love in the Huffington Post. US Puts Corporate Profits Above Preparedness for Bird Flu. Ocotber 14, 2005. Letter to USTR Rob Portman Regarding WTO Rules on the Export of Medicines and Avain Bird Flu. December 6, 2005. Members OK Amendment to Make Health Flexibility Permanent. December 4, 2005. Choreography for Adoption of the Decision on the Amendment. October 19, 2005. FAQ published by the World Trade Organization. Compulsory licensing of pharmaceuticals and TRIPS. This is a short, easy-to-read document explaining the current WTO rules for issuing compulsory licenses. December 5, 2005. Markos Kyprianou and Peter Madelson. Letter to CPTech explaining why EU Members Chose to "Opt-Out" of WTO Rules Concerning the Export of Medicines Produced Under Compulsory License. July, 2005. European Communities. Proposal for an Amendment of the TRIPS Agreement to Incorporate the Decision Implementing Paragraph 6 of the Doha Declaration on the TRIPS Agreement and Public Health. October 21, 2005. Communication from the Delegation of Zambia on behalf of the Least-Developed Country Members. Request for an Extension of the Transitional Period Under Article 66.1 of the TRIPS Agreement. March 23, 2005. Africa Group. Implementation of Paragraph 11 of the August 30th Decision. March 1, 2005. Africa Group. Legal Arguments to Support the African Group Proposal on the Implementation of Paragraph 11 of the 30 August 2003 Decision. December 8, 2005. UK Department of Trade and Industry. Secretary Johnson welcomes boost for global health. December 7, 2005. New Zealand press release. WTO reaches deal on affordable access. December 6, 2005. US Trade Representative press release. United States Welcomes Negotiations Leading to Positive Outcome on Enhancing Access to Medicines. December 6, 2005 European Union. EU welcomes permanent WTO solution on generic medicines. December 5, 2005. Representatives Waxman, Allen, and Sherrod Brown. Letter to U.S. Trade Representative Rob Portman. December 6, 2005. Médecins Sans Frontières. Amendment to WTO TRIPS Agreement Makes Access to Affordable Medicines Even More Bleak. December 6, 2005. Essential Action. Statement on Paragraph Six Deal. December 6, 2005. Sangeeta Shashikant for the South-North Development Monitor. Rushing through a "permanent solution" for TRIPS and Health. December 5, 2005. Joint NGO Statement. WTO members should reject bad deal on medicines. In order to endorse the statement, email Thiru Balasubramaniam. October 26, 2005. Martin Khor for the Third World Network. Impasse on talks on TRIPS and Health "permanent solution." October 25, 2005. Kanaga Raja for the SUNS South-North Development Monitor. WTO should review TRIPS/health decision in view of avian flu. October 24, 2005. Medecins Sans Frontieres press release. MSF to WTO: Re-think access to life-saving drugs now. September 20, 2005. Karim Laouabdia, Director of Medecins Sans Frontieres' Campaign for Access to Essential Medicines. Letter to Pascal Lamy. April 4, 2005. Sangeeta Shashikant for the South-North Development Monitor (SUNS). Heated discussions as TRIPS and Health deadline is missed. December 6, 2005. Pharmaceutical Research and Manufacturers Association. PhRMA Welcomes TRIPS and Public Health Agreement. December 6, 2005. International Federation of Pharmaceutical Manufacturer Associations. TRIPS amendment permanently resolves export compulsory license issue. December 18, 2005. Kingsley Kaswende for the Lusaka Post. International Aids Organisations Criticize WTO Amendments. December 17, 2005. Jyothi Datta for the Hindu Business Line. WTO decision may TRIP generic drug companies. December 12, 20005. Editorial in the Financial Express. Tripping on Trips - Amendment for LDC drug imports is flawed. December 7, 2005. Agence France Presse. WTO approves generic drug measure for poor countries ahead of Hong Kong. December 7, 2005. Bridges Weekly Trade News Digest. Members Strike Deal on TRIPS and Public Health; Civil Society Unimpressed. December 7, 2005. BBC. WTO upholds cheaper drugs waiver. December 7, 2005. Tove Gerhardsen for IP Watch. TRIPS Health Amendment Evokes Harsh NGO Reaction, Industry Caution. December 7, 2005. Gustavo Capdevila for the Inter Press Service. Activists Take Issue with WTO Decision on Cheap Drugs. December 6, 2005. Richard Waddington for Reuters. WTO enshrines drugs' deal for poor states in treaty. December 6, 2005. Sam Cage for the Associated Press. WTO OKs measures to improve drug access. December 6, 2005. Frances Williams for the Financial Times. WTO eases rules on drugs for poor. December 6, 2005. Tove Gerhardsen for IP Watch. WTO Strikes Agreement On TRIPS And Public Health On Eve Of Ministerial. December 6, 2005. Tove Gerhardsen for IP Watch. African Countries Ready To Accept TRIPS And Public Health Deal. December 6, 2005. William New for IP Watch. External Opposition Rises To TRIPS And Public Health Deal. December 5, 2005. Tove Gerhardsen for IP Watch. TRIPS And Public Health Agreement Appears To Be In Sight. November 20, 2005. Daniel de Beer for La Libre Belgique. Bird flu - opt-out - Belgium. November 16, 2005. Susan Finston's op-ed in the Wall Street Journal. Doha Catches the Avian Flu. October 28, 2005. Inside US Trade. African Group and US Discuss Possible TRIPS and Health Solution. October 27, 2005. William New for IP Watch. Pandemic Fears Raise Questions About WTO Health Waiver Opt-Out. October 26, 2005. Bridges Weekly Trade News Digest. TRIPS Council Remains Divided on Public Health Amendment. October 25, 2005. Scrips News Service. Activists hit out at rich countries' Tamiflu opt-out. October 24, 2005. Kathrin Hille and Andrew Jack for the Financial Times. Concern over drugs to dominate WTO. October 7, 2005. Inside US Trade. African Group Rejects EU TRIPS Amendment Proposal. June 17, 2005. Inside U.S. Trade. WTO Members Make No Headway on TRIPS as EU Proposal Still Held Up. May 27, 2005. Inside U.S. Trade. U.S. Cool to Compromise Aimed at Resolving TRIPS and Health Fight. March 31, 2005. William New for IP Watch. TRIPS Public Health Amendment Deadline Missed. March 21, 2005. William New for IP Watch. Talks On TRIPS and Health Stall As Deadline Nears. December 6, 2005. WTO reached a decision to make the Paragraph 6/2003 Decision mechanism permanent modifying the TRIPS agreement and incorporating an Article 31 Bis TRIPS Amendment. August 30, 2003. Decision of the [WTO] General Council of 30 August 2003. Implementation of paragraph 6 of the Doha Declaration on the TRIPS Agreement and public health. August 28, 2004. The General Council Chairperson’s Statement. November 20, 2001. WTO Document. Doha Declaration on the TRIPS Agreement and public health. China - In November, 2005, China passed State Intellectual Propery Office Order 37. This would permit the export of medicines, APIs and diagnostic kits produced under compulsory license for nations that had notified the WTO of their intention to import them. It limits exports to products to fight infectious diseases. Thanks to MSF for providing an unnofficial translation of Order 37. Canada - On May 14, 2004, Canada passed BILL C-9: An Act to amend the Patent Act and the Food and Drugs Act. The law came into force on May 14, 2005. The purpose of the legislation is to allow Canadian manufacturers to export antiretroviral drugs to countries lacking production capacity. Royalties paid to the patent holder vary according to the importing country's Human Development Index. Civil society groups supported the passage of the legislation, yet they also pointed out a number of flaws in the bill, including; it includes a restrictive lists of medicines, it does not automatically include medicines pre-qualified by WHO (including Fixed-Dose Combination antiretrovirals), it imposes hurdles on NGOs in the field attempting to procure Canadian generics, and it includes language against production that is "commercial" in nature. BILL C-9: An Act to amend the Patent Act and the Food and Drugs Act. (The Jean Chrétien Pledge to Africa). July 16, 2004. Letter from USTR to Canadian Minister of International Trade. Memorandum of Understanding. Canadain HIV/AIDS Legal Network Page on Bill C-9. CPTech Page on Bill C-9. The Netherlands - On December 21, 2004, the State Gazzette published the following rules, which went into effect on December 23. Policy rules on issuing compulsory licences pursuant to WTO Decision WT/L/540 on the implementation of paragraph 6 of the Doha Declaration on the TRIPS Agreement and public health, under section 57, subsection 1 of the Kingdom Act on Patents of 1995. European Commission - On May 17, 2006 the EC passed Regulation 816/2006 OF THE EUROPEAN PARLIAMENT AND OF THE COUNCIL on compulsory licensing of patents relating to the manufacture of pharmaceutical products for export to countries with public health problems. Legislative history: On October 29, 2004 the EC proposed a regulation to allow for the export of medicines produced under compulsory license. It includes many procedural hurdles and extensive safeguards. If a drug is under patent in both the exporting and importing countries, then compulsory licenses will be necessary in both countries. Additionally, NGOs may not be able to procure generics from EU countries under these regulations. Proposal for a Regulation of the European Parliament and of the Council on Compulsory Licensing of Patents Relating to the Manufacture of Pharmaceutical Products for Export to Countries with Public Health Problems. UK Patent Office. Consultation on the Proposed Regulation on Compulsory Licensing of Pharmaceutical Patents for Export to Countries with Public Health Problems. January 18, 2005. Presentation by Ellen ‘t Hoen to the European Parliament Committee on International Trade. October 29, 2004. Press Release. Statement on European Commission’s proposal for facilitating export of generic medicines to developing countries. July 7, 2005. Khalil Elouardighi (ACT-UP Paris) and Lital Hollander (European AIDS Treatment Group). Op-ed in the Economist. Time for Mandelson to face the global AIDS epidemic. October 29, 2004. Oxfam press release. EC gives positive signal on access to cheap medicines. November 4, 2004. InPharma.com. EU could allow generics of patented drugs for countries in need. November 4, 2004. Stefania Bianchi for the Inter Press Service. Cheaper Medicines for AIDS Welcomed. October 29, 2004. Associated Press. EU proposes help to poor countries seeking cheap drugs. India - In 2005, India amended the Patent Law to implement the Paragraph 6 mechanism. For the law and more information visit website on Indian 2005 Patent Reform. Insertion of new section 92A to the Indian Patent Law - Compulsory licence for export of patented pharmaceutical products in certain exceptional circumstances. " After section 92 of the principal Act, the following section shall be inserted, namely:— 92A. (1) Compulsory licence shall be available for manufacture and export of patented pharmaceutical products to any country having insufficient or no manufacturing capacity in the pharmaceutical sector for the concerned product to address public health problems, provided compulsory licence has been granted by such country or such country has, by notification or otherwise, allowed importation of the patented pharmaceutical products from India. (2) The Controller shall, on receipt of an application in the prescribed manner, grant a compulsory licence solely for manufacture and export of the concerned pharmaceutical product to such country under such terms and conditions as may be specified and published by him. (3) The provisions of sub-sections (1) and (2) shall be without prejudice to the extent to which pharmaceutical products produced under a compulsory licence can be exported under any other provision of this Act. Explanation.—For the purposes of this section, "pharmaceutical products" means any patented product, or product manufactured through a patented process, of the pharmaceutical sector needed to address public health problems and shall be inclusive of ingredients necessary for their manufacture and diagnostic kits required for their use." Final Korean Legislation to Amend the Korean Patent Act. This is the text of the language that passed on May 31, 2005. It goes into effect on December 1, 2005. February, 2005. HeeSeob Nam. Summary of Position Paper Issued by the Korea Intellectual Property Office to the National Assembly. November 26, 2004 Draft Bill for Amending Korean Patent Act. Introduced in the National Assembly on by 15 Congressmen. September 21, 2004. Earlier draft of legislation, written by HeeSeob Nam. Switzerland - Implementation of WTO decision on paragraph 6 of Doha: Proposed amendment to Swiss patent law and the comments of the Berne Declaration. "A compulsory licence shall be issued mainly with a view to supplying the domestic market. The King may by regulations prescribe rules that deviate from this." New regulations will need to be added for this to take effect. The regulations have not been drafted yet, but the following document from Norway's Ministry of Foreign Affairs makes specific recommendations for their drafting: Consultation – Implementation of paragraph 6 of the Doha Declaration on the TRIPS Agreement and Public Health (excerpts). November 22, 2004 Agence France Presse. France to apply WTO generic drug pact by 2005. TRIPS and public health: dedicated [WTO] webpage for notifications. November 30, 2004. Africa Group. Implementation of Paragraph 11 of the August 30th Decision. August 30, 2003. WTO Document. Implementation of paragraph 6 of the Doha Declaration on the TRIPS Agreement and public health. National Legislation to Export Health Goods According to Rules Set by August 30th Decision. March, 2003. James Love. Op-ed in Le Monde Diplomatique. WTO Reneges on Drug Patents - Prescription for Pain. May, 2002. James Love for Bridges Between Trade and Sustainable Development. (Year 6, no. 4) Access to Medicines: Solving the Export Problem under TRIPs. August 30, 2003. CPTech Statement on WTO Deal on Exports of Medicines. August 28, 2003. Short Note on Paragraph Six Outcome. August 27, 2003. CPTech Statement on Paragraph Six Deal. March 5, 2003. CPTech Handout. US Government efforts to limit the scope of diseases in the implementation of the Doha Declaration on TRIPS and Public Health have outraged the public health community, and have been presented in a highly dishonest way by the White House and USTR, damaging US reputation abroad. Also available in MS Word format. February 8, 2003. 21 Reasons Paragraph Six Negotiations Are Becoming A Joke. January 9, 2003. CPTech Statement on New EU Proposal. December 19, 2002. 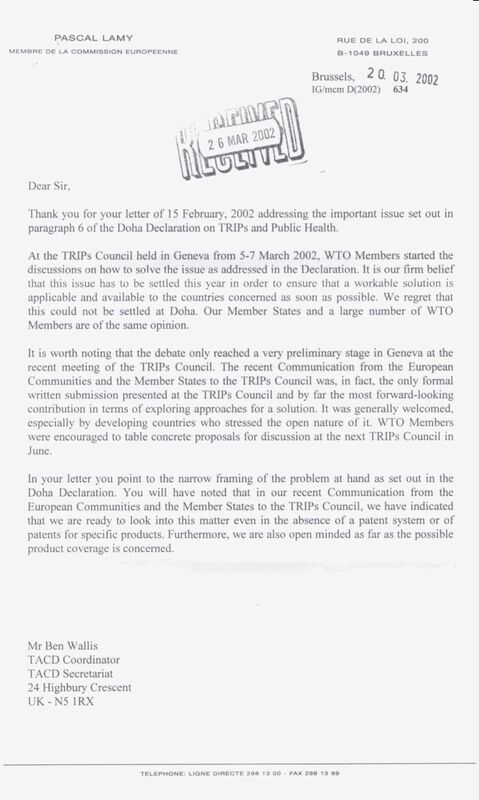 Letter from CPTech, Oxfam, MSF and HAI to WTO delegates regarding December 16, 2002 Chairman's Text for "solution" to Paragraph 6 of the Doha Declaration on TRIPS and Public Health. December 18, 2002. Note on capacity. U.S. in Philippines - "Large economies of scale are the norm and small production runs tend to raise prices. December 16, 2002. Memo to WTO TRIPS Negotiators. CPTech - Reject 16 December Chairman's text on paragraph 6 - Nine reasons. December 13, 2002. Letter to H. E. Sergio Marchi, Chairman of the WTO General Council and Dr. Eduardo Perez Motta, Chairman of the TRIPS Council. December 5, 2002. Suggestions for actions people can take to influence debate on Doha paragraph 6 solution. November 27, 2002. CPTech Note to TRIPS Council Members. Seven Reasons to Reject a Bad Deal. November 25, 2002. Joint press release with MSF, Oxfam and the Third World Network. Say No to Poisonous Proposals on Paragraph 6. November 12, 2002. Open letter to trade ministers urging that they reject US and EU attempts to impose a "limited and narrow solution" to the export issues raised in paragraph 6 of the Doha Declaration on TRIPS and public health. This letter is signed by members of other NGOs as well. November 1, 2002. Power point presenation given at the Trans Atlantic Consumer Dialogue (TACD) Committee on Intellectual Property meeting on the Impact of Intellectual Property Rules on Consumers of Health Care Services. Restrictions on exports of medicine: irrational public policy, backdoor efforts to marginalize compulsory licensing, or Northern protectionism? July 21, 2002. (Power Point) Comments on rules regarding exports without the consent of the patent owner. June 24, 2002. Quotes from joint press conference with Oxfam, the Third World Network, and Medecins Sans Frontieres. January 28, 2002. Joint letter from Consumer Project on Technology, Essential Action, Medicines Sans Frontieres, Oxfam International, Health GAP Coalition, and the Third World Network to the World Trade Organization's TRIPS Council. September 27, 2000. Consumer Project on Technology, European Public Health Alliance, Health Action International, Oxfam UK, Wemos Foundation and ACT-UP Paris. Letter to EC Commissioners Lamy and Nielson. February 18, 2003. Impasse at TRIPS Council. February 13, 2003. Motta Proposal Is Basically Dead. February 12, 2003. Bad tempers in Geneva, who is telling the truth? January 28, 2003. Paragraph Six Negotiations Update. December 20, 2002. Notes on the Scope of Diseases Debate. December 20, 2002. Europe on the Scope of Diseases. December 19, 2002. Status of Negotiations at the End of Green Room Discusions. December 19, 2002. Supachai Panitchpakdi goes to bat for PhRMA on scope of diseases. December 19, 2002. Countries that have not approved text... and issues regarding Annex. December 17, 2002. Events Today in the TRIPS Council. December 13, 2002. EU supports US on scope, US supports EU on safeguards. December 13, 2002. Additional note on state of negotiations Friday morning. December 11, 2002. Geneva Negotiations on Paragraph 6 Update. November 29, 2002. CPTech Statement on the Rejection of the Chairman's Text on Doha Paragraph 6. November 28, 2002. Wednessday on Paragraph 6 Negotiations: Why Things Broke Down. November 27, 2002. CPTech, Oxfam and the Third World Network. Deadlock over scope of diseases threatens to kill solution. November 27, 2002. How Low Can You Go? Notes from Tuesday (26 Nov 2002) negotiations on paragraph 6. November 26, 2002. Notes on Geneva negotiations on paragraph 6: How the WTO plans to get its bad reputation back. November 24, 2002. No exit strategy for para 6 negotiations? November 21, 2002. Note on Scope of Illnesses and Products. November 20, 2002. Initial comments on latest draft of Chairman's Draft of the legal language for general council decision. May 23, 2002. IP-Health message from James Love on Doha Paragraph 6: WTO in Canadian "Bolar" case on legitmate interests of foreign consumers importance of economies of scale. August 30, 2003. Implementation of paragraph 6 of the Doha Declaration on the TRIPS Agreement and public health. August 30, 2003. The General Council Chairperson’s statement. August 30, 2003. Press release. Decision removes final patent obstacle to cheap drug imports. August 27, 2003. Note from the Chairman on Paragraph 6 of the Doha Declaration on the TRIPS Agreement and Public Health. August 21, 2003. Proposed Chairman's Statement. February 5, 2003. Statement Proposed by Chairman Motta. This is the proposed "understanding" that would limit a solution to "national emergencies or other circumstances of extreme urgency." December 20, 2002. Footnote proposed by PhRMA/US/Korea/EC/Mexico which gives a restrictive list of diseases which could be covered under the "solution." December 20, 2002. WTO press release. Supachai disappointed over governments’ failure to agree on health and development issues. December 16, 2002. New Draft Legal Language for General Council Decision. December 15, 2002. Op-ed by WTO Director Supachai Panitchpakdi that appeared in the Financial Times. WTO Must Not Be Tripped Up by Drugs. Novembver 19, 2002. Draft Legal Language for General Council Decision. Implementation of Paragraph 6 of the Doha Declaration on the TRIPS Agreement and Public Health. November 10, 2002. Note from the Chairman. Possible elements of a paragraph 6 mechanism. 6. We recognize that WTO members with insufficient or no manufacturing capacities in the pharmaceutical sector could face difficulties in making effective use of compulsory licensing under the TRIPS Agreement. We instruct the Council for TRIPS to find an expeditious solution to this problem and to report to the General Council before the end of 2002. June 28, 2002. WTO press release. Council approves LDC decision with additional waiver. March, 2004. Norwegian Ministry of Foriegn Affairs. Consultation – Implementation of paragraph 6 of the Doha Declaration on the TRIPS Agreement and Public Health in Norwegian law. August 30, 2003. Statement of U.S. Trade Representative Robert B. Zoellick Following Agreement in WTO on Access to Medicines. August 30, 2003. Statement of Ambassador Linnet F. Deily, Permanent Representative to the World Trade Organization and Deputy U.S.Trade Representative, Following Agreement in WTO on Access to Medicines. February 26, 2003. Statement of Robert B. Zoellick, U.S. Trade Representative before the Committee on Ways and Means of the House of Representatives. January 14, 2003. Communication from the United States to the TRIPS Council. Moratorium to Address Needs of Developing and Least-Developed Members With No or Insufficient Manufacturing Capacities in the Pharmaceutical Sector. December 27, 2002. Letter from Robert Zoellick to Trade Ministers. December 20, 2002. USTR press release. U.S. Announces Interim Plan to Help Poor Countries fight HIV/AIDS and other Health Crises in Absence of WTO Consensus. October 25, 2002. Letter from Rosa Witaker, Assistant US Trade Representative for Africa, to African governments spelling out the US position on the Paragraph 6 problem. June 25, 2002. A Second Communication from the United States of America relating to paragraph 6 of the Doha Declaration on The TRIPS Agreement and Public Health. June 24, 2002. USTR press release. US Announces Framework to Increase Access to Drugs to Fight HIV/AIDS and other Public Health Crises. Section of Public Law 107-210 requiring the U.S. Government "to respect the Declaration on the TRIPS Agreement and Public Health, adopted by the World Trade Organization at the Fourth Ministerial Conference at Doha, Qatar on November 14, 2001" when engaged in trade negotations. September 9, 2003. Excerpts of Comments from Robert Zoellick in Cancun WTO Ministerial. February 19, 2003. Excerpts of Comments from Robert Zoellick in Tokyo. January 16, 2003. Excerpts of Comments from Robert Zoellick in Mauritius. January 13, 2003. Excerpts of Comments from Robert Zoellick in South Africa. December 20, 2002. Reps. Rangel, Levin, Matsui, McDermott and Payne. Letter to US Trade Representative Robert Zoellick. December 19, 2002. Letter from the Congressional Black Caucus to US Trade Representative Robert Zoellick. December 13, 2002. Letter from Reps. Sherrod Brown, Barbara Lee and Pete Stark to US Trade Representative Robert Zoellick voicing concern with the US negotiating position. The Africa, Caribbean, Pacfic - European Joint Parliamtentary Assembly. May 28, 2003. Communication from the African, Caribbean and Pacific Group of States. Paragraph Six of the Doha Declaration on the TRIPS Agreement and Public Health. August 30, 2003. EU Press Release. EU strongly welcomes WTO deal on generic medicines. June 3, 2003. Communication by the European Communities to the TRIPs Council. The implementation of the Doha Declaration on the TRIPs Agreement and Public Health. February 12, 2003. European Parliament resolution on authorisation of generic medicines at WTO level. January 30, 2003. Excerpt from speech by Pascal Lamy, taken from Speech by Pascal Lamy European Commissioner for Trade The Doha Round: Assessment and Prospects in the European Perspective Getulio Vargas Foundation, Center for Studies on International Economy Rio de Janeiro, Brazil. January 11, 2003. Op-ed by Pascal Lamy in the International Herald Tribune. Show the World We Can Act. January 9, 2003. EU Press Release. EU seeks to break the current deadlock on WTO access to medicines: a multilateral solution is needed. January 7, 2003 Draft Proposal For A Compromise Solution. January 7, 2003. 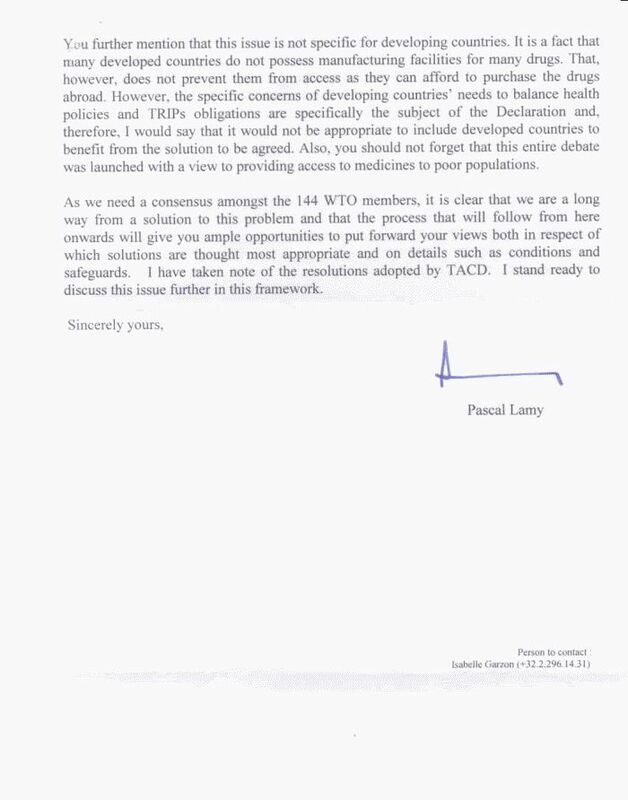 Letter from Pascal Lamy to Ministers of the WTO. November 15, 2002. Statement from EU Trade Commissoner. Pascal Lamy welcomes outcome of WTO meeting in Sydney. November 1, 2002. Position of the EU. As printed in the Nov. 1 issue of Inside US Trade. October 2, 2002. EU Committee comments on a proposed solution to be found to paragraph 6 of the Doha Declaration on the TRIPS Agreement and Public Health. April 11, 2002. Max van den Berg and Eryl McNally of the PES Group. Opn Letter to EC Commissioner Pascal Lamy. March 20, 2002. European Commissioner for Trade Pascal Lamy. Letter to the Trans Atlantic Consumer Dialogue concerning implementation of the Doha Declaration on the TRIPS Agreement and Public Health. (jpg format) Page one, Page two. February 1, 2002. Communication from the European Communities and their Member States to the TRIPS Council. Concept Paper for Approaches Relating to Paragraph 6 of the Doha Declaration on the TRIPS Agreement and Public Health. November 29, 2002. Africa Group Statement on the TRIPS and Public Health. November 14, 2002. Communication from Kenya and the African Group to the TRIPS Council. Elements of a Paragraph 6 Solution. June 24, 2002. Joint Communication from the African Group in the WTO. Proposal on Paragraph 6 of the Doha Declaration on the TRIPS Agreement and Public Health. No date. Submission to WTO by Bolivia, Brazil, Cuba, China, Dominican Republic, Ecuador, India, Indonesia, Pakistan, Peru, Sri Lanka, Thailand and Venezuela. Paragraph 6 of tthe Ministerial Declaration on the TRIPS Agreement and Public Health. September 18, 2001. Submission by the African Group, Bangladesh, Barbados, Bolivia, Brazil, Cuba, Dominican Republic, Ecuador, Haiti, Honduras, India, Indonesia, Jamaica, Pakistan, Paraguay, Philippines, Peru, Sri Lanka, Thailand, and Venezuela. Ministerial Declaration on the TRIPS Agreement and Public Health. September, 2003. TRIPS and Public Health - Statement of India. September 14, 2003. Comments by Kenya on the Second Revision of the Draft Cancun Ministerial Text. August 28, 2003. Understanding of Certain Key ‘Shared Understandings’ in the Chairman’s Statement, and Interpretation of Certain Provisions of the Decision Implementing Paragraph 6 of the Doha Declaration on TRIPS and Public Health. July 15, 2003. International Development Committee of the House of Commons on IPR. The US Government must stand up to the pharmaceutical lobby and take its developmental responsibilities seriously. September 2002. UK Commission on Intellectual Property Rights. Compulsory Licensing for Countries with Insufficient Manufacturing Capacity. This is an excerpt from the Commission's report, Integrating Intellectual Property Rights and Development Policy. February 5, 2003. Draft Implementation of Paragraph 6 of the Doha Declaration on the TRIPS Agreement and Public Health. November 12, 2002. Excerpt from Resolution passed by Parliament of Belgium supporting a solution to paragraph six based on Artilce 30 of the TRIPS. This page has the relevent passage in English, and it also contains links to the full resolution in French and Dutch. November 7, 2002. French Ministry of Trade press release. Access to drugs in developing countries. (For more info, see a note from Ellen t-Hoen from MSF on this statement, as well as statements from the Netherlands and Belgium, which also seem to support a broad-based approach to a paragraph 6 solution. November 5, 2002. Non-Paper. Substantive and Procedural Elements of a Report to the General Council under Paragraph 6 of the Declaration on the TRIPS Agreement and Public Health. September 10, 2003. Statement by 14 NGOs at the Cancun WTO Ministerial. WTO Deal a "Gift" Bound in Red Tape. September 15, 2003. Health GAP and ACT-UP Paris. WTO talks collapse, but poor countries still have to contend with a flawed deal on generic medicines access. September 13, 2003. Health GAP and ACT-UP Paris. Lamy and Zoellick clash over terms of new WTO medicines deal. September 11, 2003. ACT-UP Paris and Health GAP. WTO “solution” on cheap generic medicines poses new barriers to access. AIDS activists demand permanent amendment to TRIPS that eliminates deadly red tape. August 30, 2003. Medecins Sans Frontieres and Oxfam. Flawed WTO drugs deal will do little to secure future access to medicines in developing countries. August 25, 2003. CPTech, MSF, Oxfam, Health Action International (HAI), and the Third World Network (TWN). US seeks further restrictions on generic medicines for developing countries. February 14, 2003. Action Aid Kenya, MSF and EcoNews Africa. Affordable Medcines for Kenyans at Risk. February 10, 2003. MSF, HAI and Ofam. Access to medicines in poor countries: How the EU is backtracking on its Doha commitments. December 19, 2002. Sign-on letter sponsored by Health GAP and MSF, and signed by 70 NGOs. Open Letter to US Trade Representative Robert Zoellick. December 19, 2002. Women and Health Protection Working Group's Open Letter to WTO Members. November 25, 2002. CPtech, MSF, Oxfam and the Third World Network. Say No to Poisonous Proposals on Paragraph 6. November 14, 2002. MSF, Oxfam, World Vision and the Australian Council for Overseas Aid. Statement on TRIPS and Access to Medicines. November 8, 2002. Oxfam International; ActionAids Alliance; Consumer Project on Technology US; Health GAP, US; Health Action International; Lawyers Collective' HIV/AIDS Unit, India; Medecins sans Frontieres; Thai NGO Coalition on AIDS and Thai Network of People with HIV/AIDS; Third World Network; Treatment Action Campaign, South Africa. One year on from the Doha Declaration ... public health before private patent rights? Add your voice to ours - take action now. September 24, 2002. Letter from 20 religious leaders to US Trade Representative Robert Zoellick. May 2, 2002. Ibis Denmark, the Danish Association for International Co-operation, K.U.L.U – Women and Development and the Labour Movement’s International Forum. Comments on the European Commissions "Concept paper for approaches relating to paragraph 6 of the Doha Declaration on the TRIPs agreement and public health". January 28, 2002. Consumer Project on Technology, Medecins Sans Frontieres, Oxfam International, Health Gap Coalition, Third World Network and Essential Action. Letter to TRIPS Council on Paragraph 6. November 13, 2001. Act-Up Paris, ACT UP Philadelphia, ACT UP New York, Health GAP Coalition Press Release. WTO Declaration on TRIPS and Health--the fight is not over. April 24, 2003. Excerpt from "Priorities for Government Action, 2003-2004." Access to Medicines. December 17, 2002. Letter from TACD Steering Committee to Zoellick and Lamy on Doha Declaration Para 6 Solution. May 1, 2002. Letter to President Bush. This letter addresses the TACD positions on GMOs and trade in services as well as access to medicines and article 30 exports. February 15, 2002. Letter to USTR Zoellick and EC Commissioner of Trade Lamy concerning implementation of the Doha Declaration. Also see the press release on this letter. November-December 2003. Ruth Mayne, pulished in the Courier, the magazine of ACP-EU Development Cooperation. The Recent Agreement on WTO Patent Rules and Access to Medicines: A Flawed Deal? August 27, 2003. WTO patent rules will still deny medicines to the poor. July 26, 2003. Op-ed by Mohga Kamal and Michael Bailey in the Lancet. TRIPS: whose interests are being served? July 11, 2003. The U.S. Must Stop Blocking Access to HIV/AIDS Drugs. July 8, 2003. Access to Medicines: AIDS and Africa. February 11, 2003. Patent proposals unacceptable, rich countries wasting developing country's precious time. January 10, 2003. Jo Leadbeater, Head of EU Advocacy for Oxfam. Oxfam reactive line to new EC initiative on access to medicines. January 7, 2003. Phil Bloomer, Head of Advocacy for Oxfam. Letter to the editor of the Financial Times. The Scandal of Generic Drug Restricitions. December 21, 2002. Oxfam condemns deadlock on access to medicines negotiations. November 18, 2002. Note from Ruth Mayne (Oxfam) on the final state of the Sydney negotiations. November 15, 2002. Developing countries resist pressure to back down on access to medicines in Sydney. November 14, 2002. Oxfam America Steps Up Call For U.S. and Other Nations to Support Access To Affordable Drugs For Lesser Developed Countries. November 11, 2002. The right to medicines, or the right to profit from medicines. March 2, 2002. Oxfam Briefing Paper #15. TRIPS and Public Health: The Next Battle. September 11, 2003. Press release. Access to Medicines at the WTO: Countries Must Save Lives Before Celebrating Success. August 27, 2003. Briefing for the 5th WTO Ministerial Conference, Cancún Doha Derailed: A Progress Report on TRIPS and Access to Medicines. August 26, 2003. MSF reaction to Chaiman's statement of 21 August. August, 2003. MSF Briefing Note. One Step Forward, Two Steps Back? Issues for the Fifth WTO Ministerial Conference. June 6, 2003. Open Letter to the Members of the WTO Concerning Flawed Motta Text. May, 2003. Reneging on Doha. February 12, 2003. Sell-out at WTO on Doha declaration? February 12, 2003. Christopher Garrison. Paragraph 6: The December 16th Motta text and proposed Chairman's understandings. January 17, 2003. Letter from Bernard Pecoul and Ellen 't Hoen to WHO Executive Board Members. January 14, 2003. Letter from Ellen 't Hoen to Pascal Lamy. Response to Latest EU Paragraph 6 Proposal. January 4, 2003. Nathan Ford, Ellen 't Hoen, and Martin McKee. Letter to the Editor of the Lancet. Trade concerns must not be allowed to set the public health agenda. December 20, 2002. Breakdown in WTO Negotiations Provides Opportunity to Fix Flaw in Agreement on Access to Medicines. December 20, 2002. Note on state of negotiations from Ellen t'Hoen. Remeber the WHO on the Scope of Diseases. December 13, 2002. Letter from Richard Rockefeller, MD to USTR Zoellick. December 11, 2002. MSF Canada. Letter to Catherine Dickson of Canada's Department of Foreign Affairs and International Trade. November 27, 2002. Scaling up HIV/AIDS treatment jeopardized by WTO negotiations. November 15, 2002. Brief note from Kathryn Dihn (MSF) on the negotiations. November 13, 2002. Ministers put lives at stake in trade-off: Medecins Sans Frontieres calls for Sydney trade ministers' meeting to ensure access to affordable generic medicines. November 11, 2002. MSF calls for public support of the DOHA declaration on TRIPS and public health. June 26, 2002. Ellen t'Hoen, Medicins Sans Frontieres. Why Article 30 Will Work. Why Article 31 Will Not. June 25, 2002. Ellen t-Hoen and Pierre Chirac op-ed published in Le Monde Diplomatique. Don't renege on Doha. February 17, 2003. Statement on Access to Medicines and WTO Talks Around Paragraph Six. December 13, 2002. Letter from Consumers' Union President Rhoda H. Karpatkin to Robert Zoellick. September 11, 2003. Press release. WTO “solution” on cheap generic medicines poses new barriers to access AIDS activists demand permanent amendment to TRIPS that eliminates deadly red tape. September 9, 2003. Brook Baker. The new Paragraph Six Agreement: Clarifying Questions About Coverage. August 28, 2003. Bush Administration, Big Pharma about to secure disastrous "solution" on access to medicines at the WTO. August 28, 2003. Brook Baker. Vows of Poverty and Other Nonsense at the WTO. August 19, 2003. U.S. Latest Conditions on Paragraph 6 - Illusory Humanitarian Sales. July 7, 2003. Doha Redux - U.S. Enters New Phase of Bad Faith Bargaining. February 7, 2003. U.S. Stealth Attack on Primacy of Public Health Concerns in the Doha Declaration. January 22, 2003. U.S. Fake Post-Doha Moratorium Shows Murderous Bad Faith. December 23, 2002. Four Big Lies Post-Doha. December 23, 2002. U.S. Moratorium Is A Cruel Hoax. December 20, 2002. Thanks to U.S. bullying, no deal this year on access to medicines at the WTO - Poor countries prevent U.S. re-write of Doha agreement on public health. December 19, 2002. What's Wrong with Treating Diabetes, Heart Disease, Asthma, and Cancer? December 18, 2002. U.S.'s Broken Promise Undermines Doha Accord: Chairman's Text is Unacceptable. December 17, 2002. US's Double Standard on Doha. December 12, 2002. Access to Generic Medicines in Developing Countries Does Not Negatively Impact Interests of U.S. Consumers. December 12, 2002. Sign-on Letter to Robert Zoellick. December 11, 2002. Pharma's Relentless Drive for Profits Explains US Trade Negotiations. November 13, 2002. U.S. Breaks Promises and Undermines WTO Public Health Accord While AIDS Deaths Mount. March 4, 2002. Brook Baker for Health GAP. U.S. Post-Doha Conditions Can Kill. November 13, 2001. Health GAP Coalition, Act-Up Paris, ACT UP Philadelphia, ACT UP New York, Press Release. WTO Declaration on TRIPS and Health--the fight is not over. December 23, 2002. Christmas at WTO: 15 million people died in 2002. December 13, 2002. WTO Chairman Sergio Marchi is changing the Doha Ministerial Declaration. December 12, 2002. Negotiations at the World Trade Organization on Access to Generic Medicines: Developing Countries Find Themselves Caught Between the United States and the European Union. December 5, 2002. Developed Countries renege on their Doha commitments. November 27, 2002. Act Up-Paris zaps the EU Trade Commissioner: let poor countries access generic medicines! November 22, 2002. The lives of Millions of Sick People Are in Pascal Lamy's Hands. November 15, 2002. WTO and access to generics: The Sydney swindle. November 8, 2002. WTO and access to generics: Lamy must change sides. March 5, 2002. The European Commission Reneges on Commitments Made at Doha. August 29, 2003. No agreement on TRIPS/health. August 27, 2003. TRIPS and Public Health: TWN's Comment on Chair's Statement of Understanding of December 16 Text. August 14, 2003. Cecilia Oh. Pre-conditions by US for agreeing to TRIPS and public health solution. June 7, 2003. Cecilia Oh. Paragraph Six Negotiations, No End In Sight. February 10, 2003. Cecilia Oh. General Council "Suspends" Making A Decision on TRIPS Paragraph 6 Issue As Informal Consultations Continue on "Chairman's Understanding." February 5, 2002. Cecilia Oh. Developing countries criticise attempts to limit scope of diseases in Paragraph 6 negotiations. November 29, 2002. Cecilia Oh. Note on the latest developments on the paragraph 6 negotiations in the TRIPS Council. November 12, 2002. Chakravarthi Raghavan. US pressures SSA capitals on TRIPS and Public Health. June 29, 2002. Cecilia Oh for the Third World Network. The Problem With Paragraph 6. February 3, 2004. Implementation of the Doha Declaration Paragraph 6 Agreement - Recommendations for Exporting Countries. January 29, 2003. Statement by Robert Weissman, Essential Action on the President's Global AIDS Announcement and Generic Drugs. January 9, 2003. Shefali Sharma Statement on EU's New Compromise Proposal. December 20, 2002. Update from Shefali Sharma. Crisis on TRIPS and Health. November 7, 2002. Letter to US Trade Representative Robert Zoellick. November 7, 2002. WTO Summit: Don't Undercut AIDS Drug Access. This press release also contains links to letters to the trade ministers of the UK, Germany, Switzerland, Japan and Canada. December 16, 2002. Call for some changes at WTO TRIPS Council on "TRIPS agreement and Public Health." February 19, 2003. Letter from Bruce Wilkinson to Dominic Keating of the U.S. Mission to the United Nations. February 18, 2003. Letter from Zackie Achmat, Sipho Mthathi and Mark Heywood to Members of he U.S. Congress and to President Bush. March 11, 2003. Second letter to Pascal Lamy, addressing his response to the first. February 27, 2003. Response from Pascal Lamy to the letter of February 13. February 13, 2003. Letter from Gopal Dabade, Director of BUKO Pharma-Kampagne, to Pascal Lamy. December 13, 2002. Letter from EPHA President Andrew Hayes to EU Trade Commissioner Lamy. February 10, 2003. Health before wealth call at WTO General Council meeting. February 2, 2003. Letter to the Delegates to the WTO. January 9, 2003. Letter from Director Jim Murray to the US Diplomatic Mission to the EU. December 12, 2002. Letter from Jim Murray to Pascal Lamy on paragraph 6 negotiations. December 25, 2002. Statement on Paragraph Six Negotiations. January 1, 2002. Open Letter on Paragraph Six Negotiations. December 24, 2002. Doha Declaration on TRIPS and Public Health - EU and US Proposals, Limited Solutions and Our Objections Thereto. February 26, 2003. Letter to Trade Minister Mark Vaile, Including Proposed Lanuage for a Paragraph Six Solution. December 16, 2002. Letter from ACA to the Australian Trade Minister. December 16, 2002. Oppose Proposal by US and EU delegation. September 1, 2003. Statement of the World Health Organization on WTO access to medicines decision. January 10, 2003. Interview with German Velasquez (WHO) on negotations. December 13, 2003. Excerpt from report to the Executive Board by the WHO Secretariat WHO Medicine Stratey: Progress Report. We must now make sure that the agreed system is flexibly implemented, so that developing countries can gain access to medicines. This is a moral imperative. May 23, 2003. Excerpts from open letter sent to heads of states of the G8. November 13, 2002. Statement from UN Secretary-General Kofi Annan. Annan urges trade ministers to foster access to AIDS drugs in developing countries. September, 2003. Statement of the Joint United Nations Programme on HIV/AIDS (UNAIDS) at the Fifth WTO Ministerial Conference. March 1, 2003. Op-ed by Mamphela Ramphele and Nicholas Stern (respectively, a managing director and the chief economist of the World Bank) in the New York Times. Generic Drugs Can Make the Money Last. May, 2002. World Intellectual Property Organization. Excerpt from report of the Seventh Session of the Standing Committee on Copyright and Related Rights. This document deals with written works reformatted for the blind, not with medicines, but it is an example of another market where exceptions to IP laws are national and exports are not permitted, so huge inefficiencies exist and make the market unworkable. The World Blind Union is seeking a solution to this problem similar to the sort of "paragraph 6 solution" discussed on this page. September 9, 2003. N. B. Zaveri. Paragraph Six Problem Is Solvable and Managable Under Existing Provisions of TRIPS. September 1, 2003. Ernesto Zedillo and Casper Weinberger's op-ed for Forbes Magazine. To Be or Not to Be In Cancun. February 7, 2003. N. B. Zaveri. No problem under existing TRIPS provisions. Problem galore under proposed solution. No need to amend Art 31(f) clarify only to confirm without any condition. January 8, 2003. Sandy Thomas (member of the UK Commission on Intellectual Property Rights). Letter to the Financial Times. Problems of making low-cost medicines. December 19, 2002. Letter from the deans of major US Medical Schools to Robert Zoellick. December 19, 2002. Letter from American AIDS Doctors to US Trade Representative Zoellick. December 11, 2002. Brook Baker. Excerpt from The Ultimate Field Guide to the U.S. Economy. Death by Patent: Intellectual Property Rights and Access to AIDS Medicines. December 14, 2002. Open letter from 55 Doctors around the world WTO Members. November 20, 2002. John Barton, Chair of the UK Commission on Intellectual Property Rights. Letter to Financial Times. Overstating the case on drug patents. November 14, 2002. Al Engelberg. Memo on Doha Implementation and Price Controls. November 13, 2002. N. B. Zaveri. Article 31.f - Paragraph 6 Problem. Also posted in RTF format. November 12, 2002. N. B. Zaveri. Note onArticle 31(f). February, 2002. Fred Abbott for the Quaker United Nations. Compulsory Licensing for Public Health Needs: The TRIPS Agenda at the WTO after the Doha Declaration on Public Health. September 14, 2003. National Association of Manufacturers press release. NAM Calls Cancun Failure "Huge Miscalculation" by Developing Countries. August 30, 2003. European Federation of Pharmaceutical Industries and Associations. EFPIA Statement on Compulsory License for Export. August 19, 2003. Letter from 12 pharmaceutical executives to USTR Zoellick. January 29, 2003. Pfizer press release. Pfizer Expresses "Strong Support" for Planned Drug-Access Rules. February 5, 2003. European Federation of Pharmaceutical Industries and Associations press release. EFPIA welcomes increased public funding for diseases of poverty, but warns against undermining future research. December 11, 2002. IFPMA press release. A Sound Result Needed in the Current WTO/TRIPS and Public Health Negotiations. November 27, 2002. Letter from Carl B. Feldbaum, President of the Biotechnology Industry Organization to the USTR. November 20, 2002. Statement by PhRMA President and CEO Alan F. Holmer on the Importance of Intellectual Property for Patients Worldwide. November 14, 2002. Draft letter to Robert Zoellick being circulated on Capitol Hill. October 18, 2002. Inside US Trade. PhRMA Looks to Limit Countries, Diseases Subject to New TRIPS Flexibilits. March, 2002. Eric Noehrenberg for the IFPMA newsletter Pharma Policy News. WTO Update - TRIPS Council. April 28, 1999. Canadian Drug Manufacturers Association policy brief. Public Hearings on Canadian Interests in Forthcoming World Trade Organization WTO Negotiations. September 5, 2003. Interview in the Indian Business Standard, with D. G. Shaw, Secretary Genercal of the Indian Pharmaceutical Alliance. The WTO Accord is Anti Indian Pharma. December 9, 2002. European Generic Medicines Association. Generic medicines producers back measures to help stimulate access to medicines in least developed countries. December 3, 2002. Letter from D G Shah, Secretary General of the Indian Pharmaceutical Alliance, to African Missions in Geneva on TRIPS Council Deliberations. November 27, 2002. Letter from the European Generic Medicines Association to Pascal Lamy. November 20, 2002. Letter from Jim Keon, President of the Canadian Generic Pharmaceutical Association, to Prime Minister Jean Chretien. November 16, 2002. Letter from developing country generic manufacturers' associations to WTO Delegates. March 12, 2004. Ian Swanson for Inside U.S. Trade. WTO Members Re-Open Fight Over Substance of TRIPS-Health Agreement. March 10, 2004. Kanaga Raja for the South-North Development Monitor. Report of TRIPS Council Meeting on 8 March 2004: Differences remain on TRIPS/Health Issue, and Developing Countries Present Paper on Checklist for TRIPS/Biodiversity Iissue. September 13, 2003. Editorial in the British Medical Journal. New deal from the World Trade Organisation May not provide essential medicines for poor countries. September 12, 2003. Paul day for Reuters. NGOs skeptical about cheap drugs deal. September 11, 2003. Steven Chase for the Globe and Mail. Generic drug makers seek export rights: Association wants change to Canadian law. September 11, 2003. Inter Press Service. Cheap Medicine Agreement Under Fire from NGOs. September 11, 2003. Geov Parrish for Eat the State. The Generic Drug Ripoff. September 11, 2003. Roger Bate for Tech Central Station. Undone Deal? September 10, 2003. Editorial in the Washington Post. The Task At Cancun. September 7, 2003. BBC. Is the WTO Drugs Deal Flawed? September 6, 2003. Editorial in the Lancet. WTO takes a first step. September 4, 2003. Steve Baragona for the Voice of America. Experts Disagree on Potential Impact of Generic Drugs Agreement. September 4, 2003. The Economist. Drugs, Patents and the WTO. September 2, 2003. Op-ed by Robert Goldberg in the Washington Times. Patently Absurd. September 1, 2003. The Economist. The right fix? September 1, 2003. Business Standard. US, EU may take credit for drug deal. August 31, 2003. Naomi Koppel for the Associated Press. Deal lets poor nations import cheap copies of patented drugs. August 31, 2003. Elizabeth Becker for the New York Times. Poor Nations Can Purchase Cheap Drugs Under Accord. August 31, 2003. Washington Post. WTO Votes To Bypass Patents on Medicines. August 31, 2003. C. Rammanohar Reddy for the Hindu. TRIPS Empire Strikes Back. August 31, 2003. Neue Zürcher Zeitung. Swiss NGOs criticise WTO drug agreement. August 31, 2003. Gulf Daily News. Industry hails patent safeguards. August 31, 2003. Gulf Daily News. WTO backs long-sought deal on cheap medicines. August 31, 2003. Nick Mathiason for the Observer. WTO Drugs Deal 'Not Viable'. August 30, 2003. Richard Waddington for Reuters. WTO OKs Deal on Cheaper Generic Drugs. August 30, 2003. Associated Press. What the WTO drug agreement allows countries to do. August 30, 2003. Voice of America. WTO Reaches Breakthrough on Generic Drugs. August 29, 2003. Reuters. W.T.O. Drug Deal Close After African Plea. August 29, 2003. Associated Press. WTO Diplomats Try Again to Seal Drug Pact. August 29, 2003. Associated Press. WTO Fails to Reach Drug Agreement for Poor. August 29, 2003. Richard Waddington for Reuters. African States Plead for WTO Drugs Deal. August 29, 2003. Agence France Presse. Indian pharma relieved as WTO pact fails. August 29, 2003. Virendra Verma for the Hindu Business Line. Patent pact lights up pharma stocks. August 29, 2003. Editorial in the New York Times. Trading Needed Medicine. August 29, 2003. Elizabeth Becker for the New York Times. WTO nears approval of drug exemptions..
August 28, 2003. Richard Waddington for Reuters. WTO Set to Back Cheap Drugs Deal, Activists Object. August 28, 2003. Reuters. Africa Greets Medicines Pact with Anger, Criticism. August 28, 2003. Reuters. Drug Industry Backs Trade Agreement. August 28, 2003. Scott Miller, Scott Hensley and Matthew Newman for the Wall Street Journal. U.S. Reaches Patent Compromise To Provide Drugs to Poor Nations. August 28, 2003. Charlotte Denny and Sarah Boseley for the Guardian. Last-minute deal on cheap drugs. August 28, 2003. Brazzil News. Brazil and US, A Deal on Generics. August 28, 2003. Elizabeth Becker for the New York Times. U.S. Ready to Ease Trade Rules on Some Generic Drug Sales. August 28, 2003. Priya Ranjan Dash for the Times of India. Poor nations can order generic drugs from India. August 27, 2003. 2:49 PM ET. Richard Waddington for Reuters U.S. and Key States Reach WTO Drugs Pact. August 27, 2003. Associated Press. WTO See End Over Drugs for Poor Nations. August 27, 2003. 13:20:10 GMT. Richard Waddington for Reuters African states signal backing for WTO drugs pact. August 27, 2003. Bloomberg. 09:22 EDT WTO Draws Closer to Accord on Poor Countries' Access to Drugs. August 27, 2003. Agence France Presse. WTO envoys battle to break drugs deadlock. August 27, 2003. Inside U.S. Trade. Chairman Floats New TRIPS Text Without Naming Countries Opting Out. August 26, 2003. Naomi Koppel for the Associated Press. WTO Diplomats Silent on Generic Drugs. August 26, 2003. Richard Waddington for Reuters. Trade envoys rush for key deal on cheap medicines. August 26, 2003. Inside U.S. Trade. WTO Members Examine Draft Chairman's Statement On TRIPS And Health. August 26, 2003. Guy de Jonquires, Frances Williams, and Edward Luce for the Financial Times. Hopes for WTO deal on cheap medicines. August 25, 2003. Reuters. US sees progress on drug access issue at WTO. August 25, 2003. Bloomberg. U.S. Demands New Condition for WTO Drug Pact, Aid Agencies Say. August 25, 2003. Quentin Wray for the Independent Online. Trips deal may be struck this week. August 23, 2003. Guy de Jonquiýres and Frances Williams for the Financial Times. WTO near accord on medicines. August 22, 2003. Gustavo Capdevila for the Inter Press Service. Transnationals Urge Flexibility from Rich Nations. August 22, 2003. Independent Online. Drugs Deadlock May End Soon. August 4, 2003. Quentin Wray for the Independent Online. New hope for WTO talks. August 3, 2003. Nick Mathiason for the Observer. Big Pharma puts block on cheap drug imports. August 1, 2003. Inside U.S. Trade. Zoellick Vows to Work for TRIPS Deal, Lays Out U.S. Conditions. July 30, 2003. Associated Press. WTO drugs dispute nears resolution. July 29, 2003. Naomi Koppel for the Associated Press. Mexico WTO Envoy: Drug Patent Deal Near. July 29, 2003. G. Ganapathy Subramanian and KG Narendranath for the Economic Times. Big Pharma tries to block generic rights for local cos.
July 25, 2003. Daniel Pruzin for the BNA WTO Reporter. Allgeier Admits WTO TRIPs-Drugs Deal Still Pending, as Solution Proves. July 25, 2003. South African Press Association and Agence France Presse. Cheaper drugs deal on the cards for poor nations. July 11, 2003. Inside U.S. Trade. Pharmaceutical Companies Close to New Joint Position on TRIPS. July 10, 2003. Gary G. Yerkey for the BNA's WTO Reporter. President Bush Says U.S. Still Working To Secure Agreement on Low-Cost Medicines. July 7, 2003. Richard Carter and Andrew Beatty for the EU Observer. MEPs attack US over generic medicines. June 4, 2003. Steven Pearlstein for the Washington Post. Politics Slows Agreement on Lifesaving Drugs. July 3, 2003. Bridges Weekly Trade Digest. US Rumoured to Consider Change in Tactic on TRIPS & Health. July 1, 2003. Jeffery Sparshott for the Washington Times. Drug companies seek deal on medicine access. June 27, 2003. Inside U.S. Trade. U.S. Government, Industry Wrestle with new Approach to TRIPS and Health. June 26, 2003. Bridges Weekly Trade Digest. WTO Members Fail to Make Progress at Mini-Ministerial. June 26, 2003. Business Standard. US drugs right waiver helps WTO talks. June 23, 2003. Richard Waddington for Rueters. Drugs firms seek solution to world trade deadlock. June 22, 2003. Associated Press. WTO Talks End Without Subsidy Agreement. June 22, 2003. Guy de Jonquières for the Financial Times. Cheap drugs move to aid WTO deal. June 22, 2003. Voice of America News. US to End Restrictions on Generic Drug Imports by Poor Nations. June 12, 2003. Bridges Weekly Trade News Digest. Busy TRIPS Council Session Focuses on Health, Biodiversity, GIS and S&D. June 3, 2003. Sandeep Singh for the Business Standard. Next stop, Cancun. June 2, 2003. Roger Thurow and Scott Miller for the Wall Street Journal. As U.S. balks on medicine deal, African patients feel the pain. May 28, 2003. The Advocate. No change in WTO drug access talks. May 27, 2003. Welden Bello for the Bangkok Post. Ministerial in Mexico looks like second Seattle. April 28, 2003. Andrew Beatty and Lisbeth Kirk for the EU Observer. Prodi calls on US to shift position on cheap drugs. April 28, 2003. The Financial Express. West Outpacing Third World Concerns: Jaitley. April 25, 2003. Inside U.S. Trade. Zoellick Meets U.S. Drug Company Officials on WTO TRIPS/Health Issue. April 23, 2003. Donwald Pressly for Business Day. Erwin, US drug firms to talk licences. April 22, 2003. Reuters. WTO's Doha round must not ignore poor countries: Jaitley. April 7, 2003. Daniel Pruzin for the BNA International Trade Daily. Trade Officials End WTO Meeting On Doha With Few Signs of Progress. April 7, 2003. Charlotte Denny for the Guardian. Geneva Is Hit By War on Terrorism. April 5, 2003. New York Times editorial. Betraying the World's Poor. March 27, 2003. Op-ed in the Manilla Times. Drug wars: Patents, profits and poor countries. March 13, 2003. Cliford Coonan for Reuters. WTO chief upbeat on reviving cheap drugs deal. March 6, 2003. Agenzia Giornalistica Italia. WTO: Italy Mediator Between EU and USA, Says Urso. March 6, 2003. Anupam Chander for FindLaw.com. The Fight Over Patent Protection for Pharmaceuticals: A Major Ongoing International Negotiation Will Set the Rules. March 1, 2003. Mamphela Ramphele and Nicholas Stern for the New York Times. Generic Drugs Can Make the Money Last. March 1, 2003. Editorial in The Nation (Thailand). Access to medicine: life-or-death issue. February 20, 2003. Bloomberg. WTO drug deal due by September. February 20, 2003. Sarah Boseley and Charlotte Denny for the Guardian. Prescription for World's Poorest Remains Unwritten. February 20, 2003. Kaiser News Network. Ambassador Leading WTO Talks To Expand Drug Access to Low-Income Nations Steps Down Without a Signed Agreement. February 19, 2003. Deborah MacKenzie for the New Scientist. Trade talks fail to deliver drugs to world's poor. February 19, 2003. Agence France Presse. WTO tries to break medicine deadlock. February 19, 2003. L. Agcaoili for ABC-CBN News. Don't Limit Licensing of Drug Imports. February 19, 2003. Charlotte Denny for the Guardian. Bush blocks deal allowing cheap drugs for world's poor. February 18, 2003. Chakravarthi Raghavan for the SUNS South-North Development Monitor. No Accord or Deal (Yet) on TRIPS and Public Health. February 18, 2003. Op-ed by John Sulston for the Guardian. The rich world's patents abandon the poor to die: Non-branded Aids drugs would save a generation in developing countries. February 18, 2003. Letter to the Editor of the Financial Times from Roger Bate of Africa Fighting Malaria. Patent relaxation threatens Aids drugs. February 17, 2003. Dow Jones News. WTO Nearer To Deal On Poor Countries' Access To Drugs - FT.
February 15, 2003. Letter from Carlos Correa to editor of the Financial Times. Breakdown of Doha deal most affects developing countries' poor. February 12, 2003. Chakravarthi Raghavan for the SUNS South-North Development Monitor. Consultations continue on para 6 of Doha Health declaration. February 12, 2003. Times of India. India will stick to stand in Tokyo, says Arun Jaitley. February 11, 2002. Frances Williams for the Financial Times. WTO extends deadline on cheap drugs. February 11, 2003. David Crane for the Toronto Star. U.S. blocks poorest countries' access to medicines. February 11, 2003. Larry Elliot for the Guardian. US pressed to allow cheap drugs for poor countries. February 11, 2003. Mamata Singh for the Business Standard. Trips to address national emergencies. February 10, 2003. Inside US Trade. Key WTO Official Makes Last Stab At Brokering TRIPS And Health Deal. February 10, 2003. Richard Waddington for Reuters. Trade Talks Give More Time for Drugs Decision. February 8, 2003. Op-ed by Mukdawan Sakboon for the Thailand Nation. Bush’s forgotten message on HIV/Aids. February 7, 2003. Samira Dawani for the Daily Star. Global deal on cheap drugs for poor countries remains blocked. February 7, 2003. Richard Waddington for Reuters. Trade negotiators battle for accord on drugs. February 7, 2003. Inside U.S. Trade. EU, Japan Compromise Efforts for WTO Medicines Deal Fall Short. February 7, 2003. John Fraser for Business Day. US Drug Firms Warned Against Blocking Deal. Febraury 7, 2003. Leo Fransella Special for the Daily Yomiuri. Japan's help sought to seal TRIPs agreement. February 6, 2003. Bridges Weekly Trade News Digest, Vol. 7, Number 4. TRIPS Council Back At Square One on Medicines Issue. February 6, 2003. Washington Trade Daily. Moving Again on TRIPS/Public Health. February 6, 2003. Chakravarthi Raghavan for the SUNS South-North Development Monitor. No compromise in sight on TRIPS and Public Health. February 6, 2003. Frances Williams for the Financial Times. US May Soften Its Stance on Cheap Drugs. February 6, 2003. Agence France Presse. EU asks Tokyo to back proposals over medicine for poor nations. February 6, 2003. Agenzia Giornalistica Italia. Urso to Mediate on Generic Medecines to the South. February 6, 2003. Gulf Daily News (Bahrain). Japan bids to break WTO impasse over cheap drugs. February 5, 2003. Naomi Koppel for the Associated Press. Poor Nations Want Access to Vital Drugs. February 5, 2003. Mukdawan Sakboon for the Nation (Thailand). Activists appeal to Adisai on WTO pact. February 4, 2003. Charlotte Denny for the Guardian. Lack of drugs deal stalls trade talks. February 4, 2003. Amiti Sen for the Financial Express. WTO Sets Feb 12 As Deadline For Agreement On Health Issue. February 3, 2003. Inside Health Policy. EU Defends TRIPS Proposal, Says It Would Not Limit Disease Scope. February 2, 2003. Op-ed by Samira Dawani for the London Daily Star. Global deal on cheap drugs for poor countries remains blocked. February 2, 2003. Press trust of India. Impasse on Trips and public health. January 30, 2003. Chakravarthi Raghavan for the SUNS South-North Development Monitor. WTO talks on TRIPS and Public Health remain stalled. January 29, 2003. Daniel Pruzin for BNA's WTO Reporter. Little Movement for TRIPS/Medicines Talks As U.S. Stays Noncommittal on EU Proposal. January 28, 2003. Op-ed by John E. Calfee in the Washington Times. Patently Wrong. January 28, 2003. Frances Williams for the Financial Times. WTO tries to break deadlock on medicines access. January 28, 2003. South African Press Association. Pfizer chief says affordable drugs deal "fairly close." January 28, 2003. Raymond Colitt for the Financial Times. Industrialised nations under fire for blocking reforms. January 28, 2003. Voice of America. WTO Leader: Talks Continue On Life-Saving Drug Patents. January 28, 2003. Op-ed by John Calfee of the American Enterprise Institute in the Washington Times. Patently Wrong. January 28, 2003. Reuters. Pfizer's McKinnell says drug patent talks progress. January 27, 2003. Agence France Presse. Moves intensify to strike WTO deal on cheap medicines for poor. January 27, 2003. Naomi Koppel for the Associated Press. Hope For A Solution To Affordable Drugs For Poor Nations At The World Economic Forum. January 26, 2003. WTO Chief Sees Progress On Drugs For Poor. January 24, 2003. Kaiser News Network. Congressional Black Caucus Health Braintrust Chair Donna Christian-Christensen Encourages Leaders To Use WHO in WTO's Doha Talks. January 23, 2003. Op-ed by Tatsuo Hayashi in the Asahi Shimbun. Japan must clarify its stance on AIDS drugs. January 22, 2003. Agence France Presse. Manila urges rich nations to ease drugs patent rules. January 21, 2003. Guy de Jonquières for the Financial Times. EU condemns stance of US drugs groups. January 21, 2003. Editorial in Singapore's Straights Times. Profits of misfortune. January 17, 2003. Inside Washington. U.S. Details Conditions For WTO Dispute Moratorium Over Drug Patents. January 17, 2003. Inside U.S. Trade. EU Proposal On Scope Of TRIPS And Health Compromise Faces Criticism. January 17, 2003. Mamata Singh for the Business Standard. WHO stand may keep Trips health issue deadlocked. January 15, 2003. Reuters. UN health chief backs broad WTO cheap drug deal. January 15, 2003. Bridges Weekly Trade New Digest (Vol 7, No 1). EU Initiative Seeks to Break Deadlock in TRIPS & Health Negotiations. January 15, 2002. The Addis Ababa Daily Monitor. EU Seeks to Break the Current Deadlock On WTO Access to Medicine. January 14, 2003. Doug Palmer for Reuters. Missed deadlines endanger trade talks -WTO officials. January 14, 2003. South African Press Association. US Optomistic on EU Drug Plan. January 13, 2003. Carli Lourens for Business Day. EU Idea for Accessing Drugs Welcomed. January 12, 2003. Op-ed by Rick Mercier for the Fredricksburg VA Freelance Star. Profits Take Precedence Over Lives. January 11, 2003. Editorial in the Minnesota Star Tribune. Drug patents: Striking a deal to help the poor. January 10, 2003. Daniel Pruzin for the BNA WTO Reporter. EU Outlines Plan for Breaking TRIPs/Drugs Deadlock at WTO; Targets Scope of Coverage. January 10, 2003. Frances Williams for the Financial Times. EU moves to break cheap drugs impasse. January 10, 2003. Robert Walgate for the Scientist. EU seeks WHO help in affordable medicine dispute. January 10, 2003. EuropaWorld.com. EU seeks to break the current deadlock on WTO access to medicines. January 10, 2003. Doug Palmer for Reuters. WTO drug row overshadows U.S. trade trip to Africa. January 10, 2003. Elizabeth Becker for the New York Times. U.S. Official to Discuss Trade as Africa Hopes to Talk AIDS. January 9, 2003. Reuters. EU launches push on trade row over drugs for poor. January 9, 2003. Associated Press. EU Urges WHO to Intervene in Drug Impasse. January 9, 2003. Agence France Presse. New proposal on cheap medicine. January 9, 2003. The Advocate. Official: U.S. opposition to WTO generic-drug plan not likely to change. January 8, 2003. Reuters. WTO hopeful on Cancun round despite Doha glitches. January 7, 2003. Doug Palmer for Reuters. Bush aide defends US stance in WTO drug talks. January 7, 2003. Luiz Felipe de Seixas Corrêa, Permanent Representative of Brazil to the UN, and K.M. Chandrasekhar, Permanent Representative of India to the WTO. Letter to the editor of the Financial Times. Doha's Scope on Health Not for Discussion. January 7, 2003. G. Srinivasan and P.T. Jyothi Datta for the Hindu Business Times. Big companies move WTO to block essential drugs supply. January 6, 2003. Editorial in the New York Times. A Global Medicines Deal. January 6, 2002. Business Day. US drugs offer is a backwards step. January 6, 2003. Editorial by David Dickson for SciDev.net. Can the spirit of Doha' be kept alive? January 6, 2003. The Asia Business Times. Bush's trade agenda faces difficult tests this year. January 6, 2003. Wahib Binzagr for the Arab News. A Dream Gone Sour. January 6, 2003. Op-ed by Carl Bildt (former prime minister of Sweden) in the Wall Street Journal. Fight Poverty, Not Patents. January 3, 2003. Inside U.S. Trade. Consensus on TRIPS Unravels as U.S. Blocks Deal on Scope of Diseases. January 3, 2003. Editorial in the Finanacial Times. The importance of patent remedies. December 30, 2002. The Guardian. Bush's Bitter Medicine. December 29, 2002. Lewis Krauskopf fo the Bergen Record. U.S. at center of debate over global health, drug patents. December 29, 2002. Le Monde. Médicaments à bas prix : les pays pauvres attendront. December 28, 2002. Mukdawan Sakboon for the Nation (Thailand). The US hijacks an agreement on Aids drugs. December 28, 2002. Le Monde. Les Etats-Unis bloquent les négociations sur l'accès aux "génériques". December 27, 2002. Islamic Republic News Agency. Thai activists slam US for stalling WTO attempt to help poor. December 27, 2002. The Bangkok Post. US accused of stalling WTO attempt to help poor countries. December 27, 2002. The Advocate. U.S. temporarily eases drug patent restrictions. December 25, 2002. Jeffery Sparshott for the Washington Times. U.S. refusal thwarts WTO drug patent talks. December 25, 2002. Agence France Presse. US cheap drug offer insufficient: EU. December 25, 2002. Agence France Presse. French Drug Plea to U.S.
December 24, 2002. Agence France Presse. Rich states foiled talks on drugs for poor: body. December 24, 2002. The Nation (editorial). US drags feet on its moral obligation. December 24, 2002. Christian Losson for Liberation. Accès aux soins : réactions au veto américain. December 23, 2002. Robert Evans for Reuters. WTO Cheap Drugs Bid Stymied After U.S. Balks. December 23, 2002. Michael M. Phillips for the Wall Street Journal. U.S. Retreats From Earlier Move To Keep Drugs From Poor Nations. December 23, 2002. Chakravarthi Raghavan for the SUNS South-North Development Monitor. Scrooge's gift from rich nations to Third World at WTO. December 23, 2002. Par Christian Losson for Liberation. Les maux de l'OMC: L'Organisation mondiale du commerce discréditée par des échecs successifs. December 22, 2002. Zenit News Agency (Rome). Vatican Regrets Lack of Deal to Cut Medicine Prices for Poor Nations. December 22, 2002. Seattle Times. U.S. stance on drug patents limits access to poor, critics say. December 22, 2002. ABS-CBN News. Trade Talks Fail to Agree on Drugs for Poor Nations. December 22, 2002. SwissInfo. Swiss Regret Collapse of WTO Drugs Deal. December 21, 2002. BBC. US blocks cheap drugs agreement. December 21, 2002. Frances Williams for the Financial Times. WTO pact on generic drugs blocked by US. December 21, 2002. Paul Blustein for the Washington Post. Talks on Low-Cost Drug for Poor Nations Stall. December 21, 2002. Elizabeth Becker for the New York Times. Trade Talks Fail to Agree on Drugs for Poor Nations. December 21, 2002. Larry Elliott and Charlotte Denny for the Guardian. US wrecks cheap drugs deal. December 20, 2002. Associated Press. U.S. vetoes drug-price deal for poor. December 20, 2002. Doug Palmer for Reuters. U.S. Puts Best Face on WTO Drug Talks Collapse. December 20, 2002. Daniel Pruzin for the BNA's WTO Reporter. WTO Members Fail in Effort to Clinch TRIPs/Medicines Deal as Deadline Looms. December 20, 2002. Reuters. House Democrats urge US change in WTO drug talks. December 20, 2002. Agence France-Presse. WTO talks try to clinch eleventh-hour deal on cheap medicine. December 20, 2002. Inside US Trade. U.S. Sticks to Hard Line On TRIPS, As Supachai Tries to Broker Deal. December 20, 2002. Inside US Trade. PhRMA Remains Confident U.S. Will Hold Line in TRIPS and Health Deal. December 20, 2002. Inside US Trade. TRIPS Draft Strikes Balance on Many Issues, But Isolates U.S. on Scope. December 20, 2002. John Fraser for Business Day. US, Japan delaying WTO deal on drugs. December 19, 2002. Chakravarthi Raghavan for the SUNS South-North Development Monitor. US holds up decision on implementing Doha Health Declaration. December 19, 2002. Amiti Sen and S. Venkitachalam for the Indian Financial Express. Trips Talks Tumble On US Effect. December 18, 2002. Daniel Pruzin for the BNA WTO Reporter. U.S. Faces Tough Choice to Accept or Reject WTO TRIPS/Medicine. December 18, 2002. Op-ed by Stuart Eizenstat for the Financial Times. Protecting Drug Patents Brings Real Benefits. December 18, 2002. The Advocate. U.S. holds out on WTO low-cost drugs agreement. December 17, 2002. Daniel Pruzin for the BNA WTO Reporter. U.S. Seen Losing Ground in Latest Draft Of Reform Proposal on TRIPs/Medicines. December 17, 2002. Frances Williams for the Financial Times. US to reject accord on access to cheap medicines. December 17, 2002. Agence France Presse. France slams US stand on medicines. December 17, 2002. Gustavo Capdevila for Dawn. North-South disputes persist as WTO deadlines loom. December 16, 2002. Amy Kapczynski for the Yale Global. Strict International Patent Laws Hurt Developing Countries. December 14, 2002. The Lancet. No Agreement Reached In Talks On Access to Cheap Drugs. December 13, 2002. Daniel Pruzin for the BNA WTO Reporter. WTO General Council Suspends Meeting. December 12, 2002. Bridges Weekly Trade News Digest. TRIPS and Health Still Blocked as Deadline Nears. December 12, 2002. Daniel Pruzin for the BNA WTO Reporter. TRIPs Panel Chairman Says Talks On Drug Issues Making Little Progress. December 7, 2002. Elizabeth Olson for the New York Times. Global Trade Negotiations Are Making Little Progress. December 7, 2002. S. Venkitachalam and Amiti Sen for the Financial Express. Negotiations In TRIPs Council On Health Issues Hit A Roadblock. December 6, 2002. Inside US Trade. Zoellick Faces Heat From Congress on Scope of TRIPS and Health Deal. December 6, 2002. Daniel Pruzin for the WTO Reporter. WTO Chair Calls Weekend Meeting to Gauge Prospects for Agreement on TRIPs/Medicines. December 5, 2002. Op-ed by US Trade Rep. Zoellick in the Economist. Unleashing the trade winds. December 3, 2002. Agence France Presse. WTO Grapples With Defining Poor Countries In Trade Rules. December 3, 2002. CBC Radio transcript. Commentary from Richard Elliot of the Canadian HIV/AIDS Legal Network on paragraph 6 negotiations. December 3, 2002. Manifest-I. Pressure to reform WTO patent rules. December 2, 2002. John Fraser for Business Day. EU Head Pledges Help On Generic Medicines. December 2, 2002. Anwar Iqbal for Dawn. Poor want cheap drugs, rich have other concerns. December 2, 2002. Farah Khan for the Inter Press Service. EU Upbeat At The WTO Deal To Ease Access To Cheap Drugs For Poor. December 2, 2002. Times of India. WTO yet to find ways to offer cheaper drugs. November 30, 2002. John Zarocostas for United Press International. Rich-poor clash in WTO over cheap drugs. November 30, 2002. Agence France Presse. WTO talks on cheap drugs must focus on epidemics: IFPMA. November 29, 2002. Daniel Pruzin for the Bureau of National Affairs. NGOs Denounce Draft TRIPS, Medicines Text at WTO as Unworkable. November 29, 2002. Inside US Trade. House Members Push for Tough U.S. Stance on TRIPS and Health Deal. November 29, 2002. Gustavo Capdevila for the Inter Press Service. Industrialised North Puts Brakes on WTO Medicine Accord. November 29, 2002. BBC News. World Deal for Cheap Drugs Stalls. November 29, 2002. Chakravarthi Raghavan for the North-South Development Monitor. South, including LDCs, don't need the restrictive TRIPS decisions. November 28, 2002. Chakravarthi Raghavan for the North-South Development Monitor. Implementing Doha health declaration or playing a con game? November 28, 2002. Agence France Presse. LImits Propsed on Low-Cost Drugs Program. November 26, 2002. Reuters. Rich states accused of bad faith in WTO drug talks. November 26, 2002. Editorial in the Nation. What Did the WTO Really Achieve? November 26, 2002. Chakravarthi Raghavan for the North-South Development Monitor. November 26, 2002. John Mason and Frances Williams for the Financial Times. WTO concern over progress in Doha talks. November 26, 2002. Priya Ranjan Dash for the Times of India. Year end deadline key to poor nations faith in WTO: Abbott. November 25, 2002. Chakravarthi Raghavan for the North-South Development Monitor. Retrogression on implementing Doha Public Health Declaration? November 25, 2002. Richard Waddington for Reuters. World trade talks struggle over cheap drugs access. November 25, 2002. Associated Press. WTO Drug Access Negotiations Begin. November 25, 2002. Editorial staff of the Wall Street Journal. The Assault on Drug Patents. November 24, 2002. BBC. Global drugs deal urged. November 23, 2002. Bebe Loff for the Lancet. World Trade Organization wrestles with access to cheap drugs solution. November 22, 2002. Chakravarthi Raghavan for the North-South Development Monitor. Talks continue on key issues to implement Doha health declaration. November 21, 2002. Business Day editorial. So close, yet so far for WTO agreement. November 21, 2002. Chakravarthi Raghavan for the North-South Development Monitor. TRIPS talks on implementing Doha run into more problems. November 21, 2002. Tom Miles for Reuters. Nobel laureates urge deal on cheap drugs for poor. November 18, 2002. John Fraser for Business Day. WTO makes progress on generic drug rules. November 16, 2002. The Financial Express. Shourie Calls For Early Resolution Of Drug Access Issues Under Trips. November 16, 2002. Heather Stewart for the Guardian. WTO pledges cheaper drugs for poor countries. November 16, 2002. Priya Ranjan Dash for the Financial Times. [Indian] Drug Cos to benefit from Sydney deal. November 16, 2002. John Kerin, Trudy Harris and Misha Schubert for the Australian. Drugs for the Poorest. November 16, 2002. Philip Hopkins for the Age. Summit paves way for cut-price drugs. November 16, 2002. Australian Broadcasting Corporation. WTO meeting wraps up with medicine deal for poorer nations. November 15, 2002. UN Newswire. Ministers At WTO Meeting Report Progress On Generics. November 15, 2002. Inside US Trade. New Chairman's Draft Moves Toward Developing Countries on TRIPS. November 15, 2002. Reuters. Africa Bloc Applies to WTO for License to Produce Cheap AIDS Drugs. November 15, 2002. Associated Press. WTO Members Reach Consensus On Cheaper Drugs to Poor Nations. November 15, 2002. John Fraser for Business Day. WTO on brink of new laws for generic drugs. November 15, 2002. Agence France Press. WTO ministers agree on drugs deal. November 15, 2002. BBC News. Aids drug deal 'within reach'. November 15, 2002. South African Press Association. Deal to give drugs to poor. November 15, 2002. Virginia Marsh for the Financial Times. Cheap drugs deal boosts trade talks. November 15, 2002. Charoen Kittikanya and Aphaluck Bhatiasevi. Finaicial Times' Asia-Africa Intelleigence Wire. Accord reached on cheap drugs for poor. November 14, 2002. Washington Post Editorial. Drugs for the Poor. November 14, 2002. Neil King Jr. for the Wall Street Journal. Expect Progress to Be Tough At WTO Summit on Drugs. November 14, 2002. Frances Williams fothe Financial Times. Patents hurdle tops agenda at Doha talks. November 14, 2002. Katarine Millar for Business Day. WTO ministers meet to narrow trade differences. November 13, 2002. Amyarta Sen and Sir John Sulston. Letter to the editor of the Financial Times. Little progress in lifting restrictions on access to inexpensive medicines. November 13, 2002. Agence France Presse. Australia-WTO-drugs: Drugs access to test WTO credibility in poor nations says Australia. November 12, 2002. Australian Broadcasting Co. Trade ministers to meet to discuss cheaper medication. November 12, 2002. Associated Press. Trade summit must see how poor nations can get cheap drugs. November 10, 2002. Steve Schifferes for the BBC. Doha trade deal unravelling. November 9, 2002. AFP. Two-day WTO mini-summit begins in Sydney Thursday. November 8, 2002. Inside U.S. Trade. U.S. Signals Flexibility As Poor Countries Reject TIPS Deal Exclusions. November 8, 2002. Chakravarthi Raghavan for the North-South Development Monitor. Marking time in TRIPS consultations on public health? November 6, 2002. Daniel Pruzin for the BNA WTO Reporter. WTO Members Give Mixed Reviews To EU Compromise Proposals on TRIPS. November 6, 2002. Reuters. EU sees 2002 deal by WTO states on cheap medicines. November 1, 2002. Inside U.S. Trade. EU Floats Compromise Drug Patent Plan Before Senior Officials Meeting. October 25, 2002. Inside US Trade. Developing Countries Push for Broad Leeway under Drug Patent Rules. July 6, 2002. Fiona Fleck for the British Medical Journal. "Foot dragging" by the West threatens drugs deal for poorer countries. June 25, 2002. Reuters. EU, U.S. Accused of Backing Out of AIDS Drug Pledge. June 25, 2002. Geoff Winstock for the Wall Street Journal. Europe Officials Support Purchase Of Generic AIDS Drugs for the Poor: AIDS activists complain that it isn't doing enough. June 25, 2002. Elizabeth Olson for the New York Times. U.S. Backs New Trade Rules on Drugs. June 17, 2002. Washington Tariff and Trade Letter. EU Narrowing Porposal on Drug Exports Under Compulsory License. Firehead's curse on persons negotiating the paragraph 6 solution. This is a 1.8 meg quicktime file.